Duobase (sold seperately) — If you own a DuoSharp® Diamond Bench Stone, this accessory is a "must have". The black molded base can be used with either size DuoSharp® and provides 2" knuckle clearance for ease of use. Rubber feet secure the base and stone to your workbench. The stand also features a convenient handle on the underside for moving the stone over a large work piece — a unique feature that provides maximum versatility! 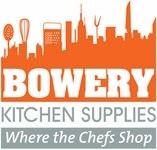 Copyright 2006 Bowery Kitchen Supply. All rights reserved.